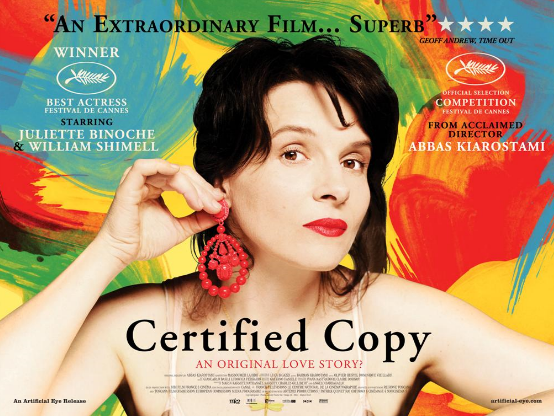 Certified Copy is about a man and a woman. James Miller (William Shimell) is an author who’s visiting Italy to talk about his new book on the idea of originality in art. The woman (never named, played by Juliette Binoche) is a French-born gallery owner who seems captivated by those ideas. After his lecture, they drive to a nearby village. They start to talk about work, life, movement. It seems as if this is the beginning of a beautiful romance. But then some things are said. Some things aren’t quite said. Everything that we’ve seen and so happily gone along with seems pregnant with sadness, with ambiguity. El Teatro Apolo acoge una sesión más del Cine Club Universitario. En esta ocasión, los amantes del séptimo arte podrán ver ‘Copia certificada’, un film del iraní Abbas Kiarostami, rodada en 2010. Este trabajo obtuvo la Espiga de Oro por la Mejor Película en el Festival de Cine de Valladolid. El film se podrá ver el jueves, en dos pases, a las 20 y a las 22 horas, en el Teatro Apolo.